HOLIDAY PROGRAMME OF THE YEAR WINNERS! 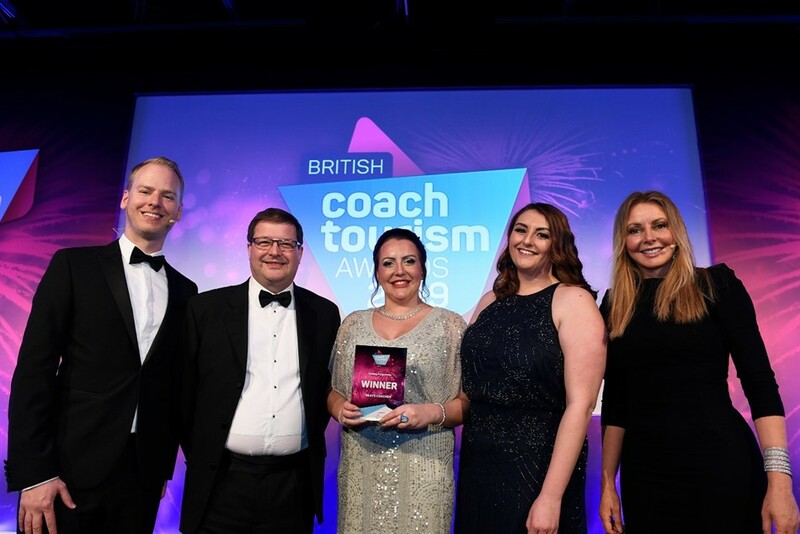 The UKs best coach tour operators, destinations, visitor attractions, hotels, and tourism industry suppliers, were honoured on Wednesday 20th March at the 2019 British Coach Tourism Awards. Reays Coaches, were announced as winners of the Holiday Programme of the Year category. This award is open to all UK based operators that operates a programme of coach holidays. The judges were looking for a programme that demonstrates innovation and creativity, in a brochure that is easy to navigate with clear price points and an easy-to-understand summary of what the tour and price includes. With so many brochures now meeting this criteria, the judges recognised and awarded Reays for offering something that stands out from the crowd. The annual awards  the only national awards scheme that specifically focuses on coach tourism  were organised by Diversified Communications UK. This years celebrity presenter was TV personality Carol Vorderman MBE. David Maguire, chair of judges and event director of British Coach Tourism Awards says: Huge congratulations goes to all our winners in this years British Coach Tourism Awards. With real emotion among our highly deserving winners and a fantastic atmosphere of celebration, I believe it was one of our best awards yet. Once again, the quality of the entries reflected the quality and importance of the amazing coach tourism sector and the inspiring professionals working in it. The awards are a great way to reward them for their hard work and dedication to the UK tourism sector, so its an honor to be a part of that. Well done to everyone who took home an award, and a huge thanks to our judges, our partners, and everyone in the industry who supports the event, says Maguire. The team at Reays Coaches were jumping for joy on Friday 25th January when it was announced that Cumbrias largest, independent coach operator has been shortlisted in the Holiday Programme of the Year category at the long established and greatly respected British Coach Tourism Awards. The British Coach Tourism Awards recognises the crème de la crème of the coach tourism sector. Launching their 2019 holiday brochure in Autumn 2018, Reays quoted it as their best ever brochure to date providing everything from mini-breaks to a full weeks holiday, sporting events to family adventures and we're hoping the judges recognise our innovative and creative programme too, when the winner is announced at the biggest night in the coach tourism calendar, at The National Motorcycle Museum on Wednesday 20th March. Kerrie Allison, Head of Sales & Marketing at Reays Coaches said: We are absolutely delighted that Reays has been recognised celebrating the best of the coach tourism sector we work in at a national level. Delivering world class customer service consistently in todays world of economic and political challenges isnt easy but we are surviving and thriving thanks to our fabulous fleet of vehicles, the drive and determination of our people and our customers who appreciate the Reays difference. We have to wait until March until our fate is determined. You can find out more about our progress by visiting our website or following us on social media.